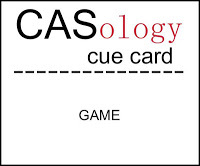 a new Cue Word at CASology! I thought it was fitting that I used one of their sets...Games People Play. It's a great set with so many possibilities. I don't normally use such bright colors, but in small doses it definitely works in CAS design. 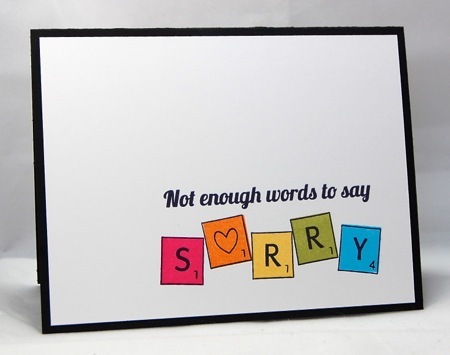 And what a bright and cheery way to let someone know you are sorry! Hop on over to CASology to play along and visit the rest of the team to see how they were inspired by GAME. Your card is so fun! Love the bright colors!!! I love the bright colours of your tiles! I love the rainbow on the letters! Great take on the cue card. Love the heart for the "O"! super cute card... love the little letter tiles! adore this scrabble card.. wonderful idea! So. Darn. Cute! Totally CASEing this cute little rainbow card! Such a sweet way to say SORRY! BTW, I love your new blog look! Love the bright colors ~ great card! Maureen, this is such a bright, cheerful card and would surely convey the message intended. Clever! I'm sorry I'm so late getting around to telling you that I adore your "game" card, Maureen! Sorry always was, and still is, one of my favorite board games. Your sentiment and execution are inspired! !